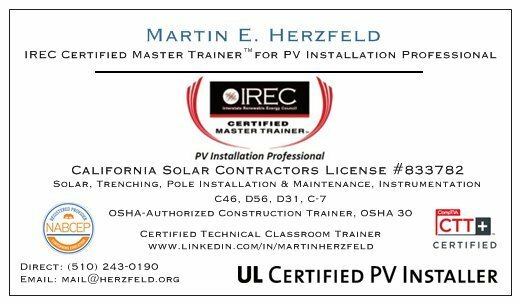 An active California licensed contractor with not only solar contracting and inspection contracts, but also serves as an adjuct professor at a college, contract training provider in a school district and a trainer at community based organizations. "Herz ❤️ feld ⛰️" in German means "Heart Field" and we specialize in consulting, inspection and contracting of field ground-mounted solar energy systems. Deploying ☀ solar ⚡️ energy 🔋systems ⛰️ with the love of people 👵🏽❤️ + planet 🌎 in mind, where 🚗 = Zero. Simply, it's about the impact of people and with a net-zero energy impact on the planet. In business since 2001, Martin Herzfeld became a California licensed contractor #833782 in 2004 and an accredited business with the Better Business Bureau (BBB) in 2008. He is a consultant, registered installer, and retailer in California. Martin's classifications include solar C46, trenching D56, pole installation and maintenance D31, - ground mounted solar arrays - and low voltage systems C7 - instrumentation -monitoring and PV systems performance. Continuing and ongoing education in California Electrical Code (CEC) / National Electrical Code (NEC) in the states for practical safeguarding other I codes. He has achieved the designation as Certified Photovoltaic System Installer from Underwriter Laboratories (UL) and is one of first couple dozen to achieved this designation along with recertification for ongoing continuing education units (CEUs). Martin is a CompTIA Certified Classroom Technical Trainer (CTT+) and is an OSHA-Authorized Construction Trainer.